The current mild nights are producing some good light trap records, the best moth this morning in my roof terrace trap in St Leonards was this golden twin-spot. Other migrants in the trap were a silver y and 2 rusty-dot pearl. 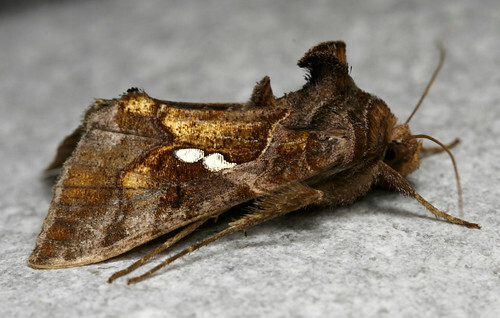 The best of the local moths was a cypress carpet and a beaded chestnut (a very scarce moth in Hastings). I’ve taken to wandering around Lime Kiln at night looking for spiders with a torch, and while this does get some funny looks it also turns up some good things. Last night I found this male False Widow (Steatoda nobilis) near the shop door. Like the Western Conifer Seed Bug mentioned below, this species is an introduction to Britain, arriving from Madeira and the Canaries in shipments of bananas (you may hear this and similar species referred to as ‘Banana spiders’ as a consequence). Andy Philips tells me that this species has spread along the coast from Brighton in recent years, with the first record from Hastings only a couple of weeks ago.